Sweatshirts and Patches and Socks, Oh My! Every few years, thousands of Arrowmen from across the nation travel to the National Order of the Arrow Conference (NOAC) for the experience of a lifetime. Though, as any past delegate knows, memories are not the only thing taken home. The NOAC Trading Post is consistently a conference highlight – offering exclusive and speciality items for any and all budgets. This year, Western Region Chief Jordan Jefferis and his team want to make it even better through the increased involvement of youth in the planning process and execution. They began by sending out a survey to lodge leadership, which resulted in over 200 responses. This survey focused on what youth wanted to see in their trading post. Jefferis believes the feedback received was very valuable. One of the most popular requests was a NOAC belt buckle, which he is especially excited to offer this summer. Additionally, the trading post staff sought to increase their youth staff. At past conferences, youth trading post staff have numbered few to none. What is especially exciting is there are still positions available! Anyone interested can apply to serve on staff. The trading post will offer everything from hats to socks and everything in between. Clothing is not what they anticipate will be the most popular item, though. If you ask Northeast Region Chief Justin St. Louis, he will direct your attention to the patches. This NOAC will have 11 different patches, but acquiring them all may not be so easy. Only the basic patch is available at the trading post, leaving 10 left. Each patch follows the same basic design, with different color patterns. The Delegate patch will be given to every NOAC participant this year, but there is a twist. Unlike past conferences, there will not be a pocket loop on this patch. This is where the Maze Runner patch comes into play. Unlike the Delegate patch, this one has a slightly different color design and comes with a pocket loop. To earn this patch, you must complete the conference-wide game. Everyone will be able to complete it, and it will be based on participating in NOAC activities. The Remote Delegate patch will be mailed to anyone who signs up for the remote delegate program. This program is intended for Arrowmen who are unable to attend NOAC in person, but still wants in on the action. More information about remote delegates can be found here. The Lodge Leader patch will be given to the lodge key-3 and contingent leaders. The Staff patch will be given to all NOAC staff members. There are still positions available – sign up here! The Legacy patch will be given to those who donate to the national endowment. The Leadership/VIP patches will be given to the national officers to distribute. The VIA patch will be given to those who attend the designated “Very Important Arrowmen” luncheons. The Thank You patch will be given out by the conference vice-chiefs to Arrowmen they find integral to NOAC’s success. Already signed up for NOAC and want to guarantee you get your favorite NOAC merchandise? 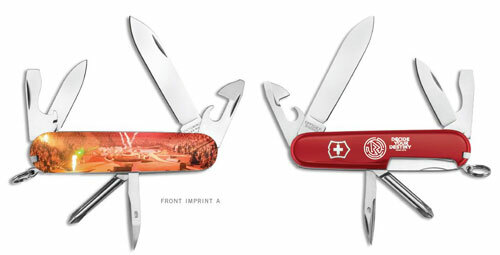 Pre-order your gear today at the online trading post, including NEW custom Swiss Army knives! This knife features the NOAC 2018 logo on one side and a stunning image from a NOAC show. 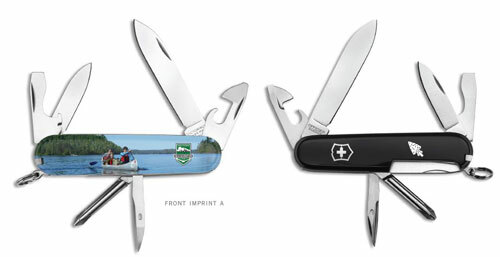 This knife features the OA logo on one side and a beautiful view from the OA Wilderness Voyage program. Not signed up yet? Talk to your lodge chief or adviser today to find out about attending with your lodge’s contingent!